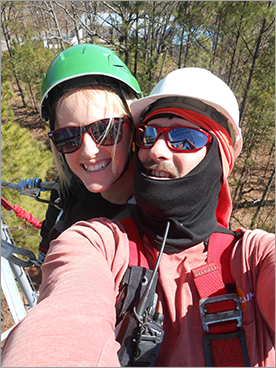 Our president Steve Wilcox has been in the rope access world for over 25 years. Starting originally as a Communication Tower worker in 1996 building the largest man made structures in the world until eventually moving into more complex access work. His accomplishments are vast. Original co-founder of ComTrain which is a rope access training company for the tower worker, he and Winton were instrumental in designing that industries blueprint for all “Tower Climbing Safety and Rescue” training for that field. Forming his own rope access construction company in 1999 he still works in that field but is also heavily involved in camera systems for local and federal governments on bridges and buildings across the United States. Audri-Alice Adgie met Steve in 2013 and has immersed herself heavily in the same fields. Taking every class possible and working even today in that construction field. She is a graduate of the University of West Georgia with a major in psychology in communications. She is also the voice of Extreme Vertical & Industrial Limits. And, trust me if you see the two together, she is the face of it too. We based our operations in California for many reasons. One is the fact that we are directly between the large Sierra Mountains and the beautiful hiking bay area hills where we love to climb and play. The other is that we started as a rope access company working in the area. Our sister company (Line of Sight Communications) has been erecting and maintaining large broadcast towers, camera systems on the Bay Bridge and many other rope access jobs for over 25 years. Please feel free to contact us with any of your training or equipment needs on our form here or simply contact us directly with the information below. Stay 100% connected!